Suddenly it appeared out of the blue-green heading straight for us. My heart was beating so fast I thought it would explode; I looked towards Mike and saw that he too was so awestruck he hadn't yet started to photograph. Mike Cufer and I were only metres off Sydney's famous Manly Beach experiencing our first encounter with a whale. Catching us both unawares, we quickly duck-dived down to five metres and watched the female southern right whale pass by us. Below her enormous tail, the seemingly tiny calf followed closely. After a few seconds I realised that I was already short of air and had not yet taken a photograph. I fumbled for my Nikonos and quickly reeled off three shots before heading for the surface. 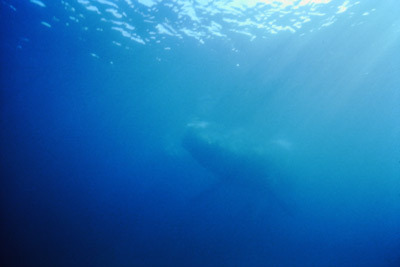 Taking a quick breath, I again headed down but already the whales were a dark shape swimming away from us. I prayed that this was not the only chance that I was to get to photograph the whales. The female southern right whale, Eubalaena australis, had given birth to the calf four nights earlier only a few kilometres to the north of Mona Vale Beach. After the birth the whales had roamed the short distance between Manly and Collaroy while the infant gained strength and experience before venturing out to the open sea. 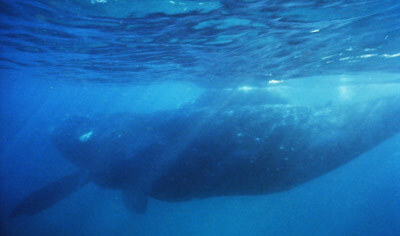 Although diminutive compared to the mother, the calf was already about five metres long. 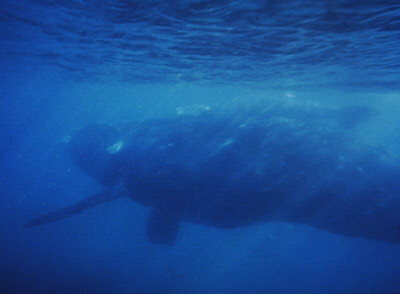 The presence of the first calf born off Sydney in living memory entranced the entire population of the Sydney metropolitan area. The whales drew extraordinary media attention and each night the television crews carried reports and footage shot from helicopters; radio stations gave hourly updates on their location and experts speculated on what the whales would do next. Enormous crowds visited the coast to see the two whales, causing traffic jams around the Manly area. Local surf club officials were heard to wish that their carnivals could attract a similar crowd! The southern rights appeared to settle into a pattern. Before dawn they headed north a few kilometres and stayed in this area patrolling the beach and headland, never moving more than 200 metres from the shore and were sometimes right behind the breakers or next to the rocks. They seemed very relaxed and did not move very far or very fast. The calf appeared very playful and when it was just three days old it was observed breaching and swimming away from its mother. Towards nightfall, the whales headed south back towards Manly. On each of the first four nights they spent the dark hours off Fairy Bower and Shelly Beaches at Manly. On the fifth night they visited Sydney Harbour and created a bit of a panic the next morning when a Manly Ferry sighted them in its path. The week closed with the whale s moving north to Newport where they spent increasingly longer periods of time submerged to train the calf for the extensive journey ahead. As well as diving for periods of five to seven minutes (compared to one or two minutes earlier in the week), the calf spent more time leaping out of the water in spectacular breaches. That afternoon another southern right whale joined the pair but was gone the next morning. The second week saw the mother and calf move further north to the Central Coast. Since we already had licences from the New South Wales National Parks and Wildlife Service (NPWS) to approach whales for photographic purposes within the protective exclusion zone, Mike and I arranged with Dr Ian Gordon of Manly Oceanworld to use their boat to find the whales and make our work easier. The whales had again overnighted off Fairy Bower Beach but on this morning had not headed north but were still only a few hundred metres away. After speaking to the NPWS officer in charge, motored to the 200 metre boat exclusion zone and entered the water. 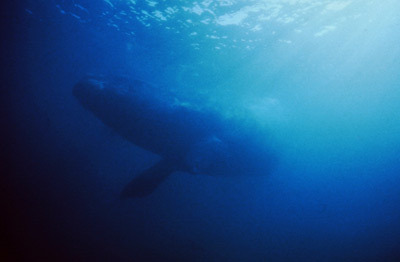 We swam slowly towards the whales, keeping our eye on their last location. Before we had gone 50 metres they disappeared and I lost sight of them for a few minutes. Suddenly, Mike called out that they were coming towards us. I looked below the surface and there they were. After swimming effortlessly past us, the whales moved a little to the north. We slowly made our way towards Manly Beach, trying not to unsettle the whales or upset the growing crowd watching from the beaches and headlands. Mother and child became more mobile, ranging up and down the beach about 300 metres. After an hour they started swimming back towards us. They seemed to be homing in on Mike just in front of me; they got closer and closer. I started looking under the water and then, there was the mother approaching me. I took a deep breath and dived down about four metres and started taking photographs, trying to get all of the massive mother into the photograph. The scene in front of me seemed to be almost in slow motion, the whale seemed to be taking ages to pass. I was only a few metres away and I was certain she was watching. The whole encounter had probably only lasted 30 seconds or so, but it had seemed like minutes. How to describe it? It is extremely difficult to put into words what we felt during and after the encounter. Mike said that when we first saw the whales he was so excited that he had thought that his heart was going to jump out of his wetsuit. He has dived with creatures like great whites, tiger sharks and even saltwater crocodiles, yet he says that this encounter topped the adrenalin rush. I was struck by the huge size of the mother and her graceful movements. The calf, so small by comparison, almost clung to the mother as it followed somewhat clumsily. After the dive I kept reliving my experiences, thinking how privileged I had been. Even if I never again dive with whales, I will remember forever this first meeting with the leviathans of the sea which occurred, appropriately, "Seven Miles from Sydney and a thousand miles from care"*. *	Slogan of the Manly Ferries. For more information on whales in the Sydney area, see Bill Russo's Sydney Whale Web Site. This encounter happened in June 1993 and this article appeared in the October/November 1993 issue of Sportdiving magazine.